The Samoa International Fish Gaming Association Tournament finale took place yesterday with an official closing ceremony. 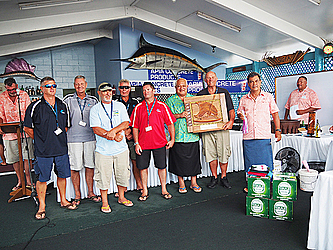 In the end it was the Anglers from American Samoa team ‘Double Hooked,’ captained by Skipper, Peter Crispen, who took the grand prize overall of the tournament coming in first place with 91.6 points. The Minister of Agriculture and Fisheries, Lopao’o Natanielu Mu’a and M.A.F. Chief Executive Officer, Tilafono David Hunter presented the awards for the winners of individual and team categories with the Minister giving the closing speech. The President of S.I.G.F.A, Poao Francis Hansell, thanked their sponsors and supporters who made the tournament possible. “We are here to celebrate what has been a great week of fishing,” said Poao. “Some good fish caught, released and a few that got away. Great sportsmanship was shown on and off the water. We thank you for the continuing support of the past and present sponsors and without you all this tournament would not have been possible." “A very special thank you to our major sponsor – the Wetzell family at the Apia Concrete Products for your continuous support year after year. A big faafetai tele to the Samoa international Finance Authority for your continued support." During the closing ceremony, Angie Wetzell presented a cheque for $30,000 to the Samoa International Game Fishing Association on behalf of Apia Concrete Products (A.C.P.) who have been a major supporter of the tournament since it began. Minister Lopao’o thanked the Samoa International Fish Gaming Association for their work in making the event an annual success and their contribution to Samoa’s Tourism. He also said that he looks forward to welcoming Anglers to his district when they move on to the Asau Fishing tournament next week.